Clearly there is a lot of love for the Silver Banksia in our region! About 60 people gathered in Harcourt on Monday 19 March 2018 to hear geneticist Adam Miller present the latest results from his genetic studies on Silver Banksia (Banksia marginata) populations – hot off the press! Adam Miller presents to a full house at the ANA Hall. Dr Adam Miller is a geneticist from Centre for Integrative Ecology, School of Life and Environmental Sciences, Deakin University. Adam has a wide range of research interests, including ecological genetics and genomics, wildlife conservation and environmental restoration, pest control, environmental stress and adaptation research. For the science buffs among you, Adam’s extensive publication history on Google Scholar can be found here. 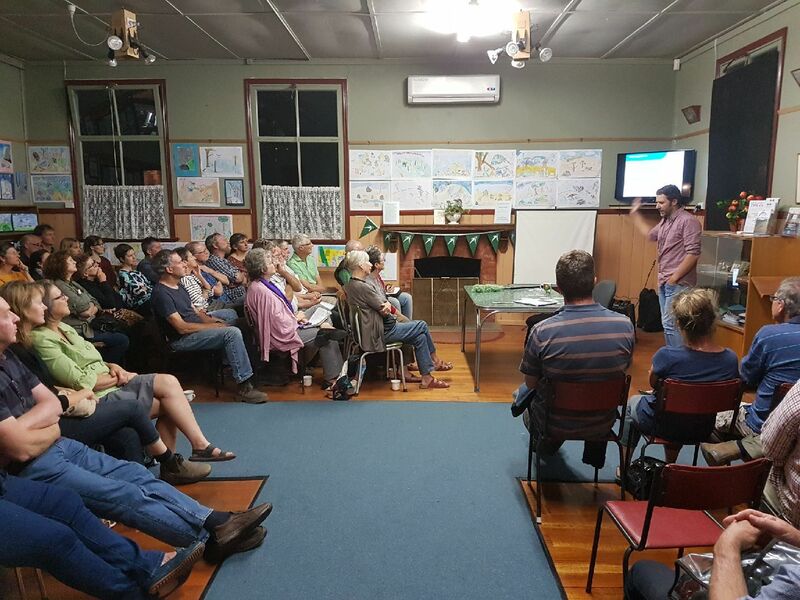 Adam’s talk was titled ‘Planting for the future through smart genetic management: Banksia Marginata as a case study’. The presentation was absolutely fascinating. Any genetics project needs a lot of preparatory explanation. I’d already taken seven pages of notes before we got onto the banksia project proper! Silver Banksias were once common all over the Victorian Volcanic Plains and the Mount Alexander area, but now we only have isolated populations of old individuals. The banksias face many threats. Recruitment of new plants is very difficult as young plants are eaten by rabbits or wallabies, and the young plants can’t grow through thick Phalaris grass. Herbicide spray drift from farms is another threat. However, Adam and other conservation geneticists believe that loss of genetic diversity is a key driver in the extinction of species, and without active management we can’t be confident these species will survive climate change. If we can’t get it right for an iconic species such as Silver Banksia, the future looks grim for other struggling species, such as Drooping Sheoak (Allocasuarina verticillata). Genetic diversity underpins the ability of a population to respond to environmental change. High diversity increases the chance there is enough variety for at least some of the population to cope with environmental changes. Low diversity increases the chance of extinction. The Central Victorian Banksia Working Group wanted to find out what is going on with the genetics of the surviving Silver Banksias. Are they genetically isolated? Are they in poor genetic health or in-breeding? Where is the best genetic material? Which plants should we collect seed from for replanting or creating a seed orchard? After the presentation, people crowded around Adam and the screen to hear more! All banksia populations in central Victoria are genetically isolated from one another, meaning populations are not cross-pollinating. There is no current evidence of inbreeding – the genetic diversity of all the samples is still quite good! However, there is an imminent risk of inbreeding due to genetic isolation. Managed intervention will be needed to prevent these populations from disappearing. Analysis of the Victorian Volcanic Plains banksia population showed similar results. Manage the isolated remnants by mixing up genetics to reduce the risk of future inbreeding. Select seed from multiple locations across the landscape. Selection and blending of seed from across the isolated populations – known as ‘multi-provenancing’ – will help provide the genetic diversity so desperately needed to cope with a changing climate. Track plant provenances through time, so we can assess which ones survive better in this climate. This can be done on people’s properties or through establishing seed orchards. Improve connectivity across the landscape to facilitate the movement of pollinators. We currently don’t know who the key pollinators are, but the genetic studies reveal there should be a maximum of ten kilometres between populations to allow cross pollination. 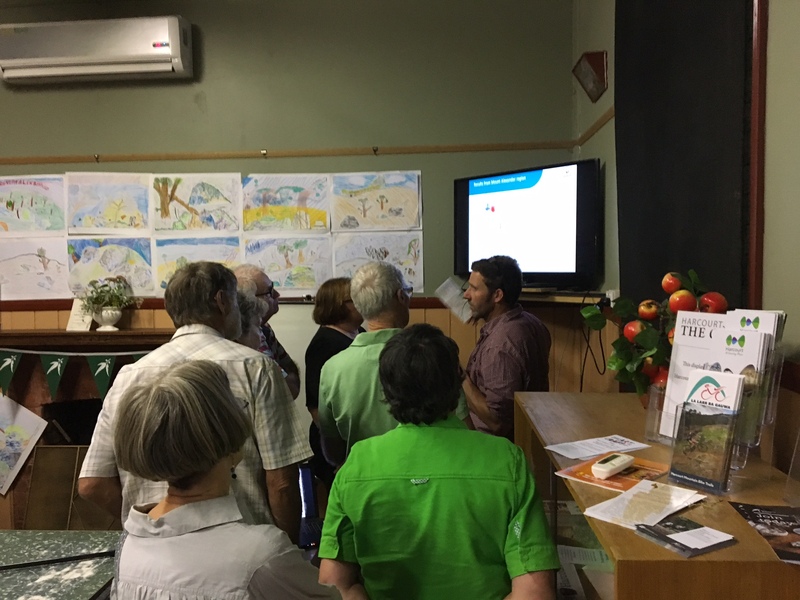 Harcourt Valley Landcare Group hosted the event along with the Central Victorian Banksia Working Group. Bonnie Humphreys (President of Harcourt Valley Landcare Group) thanks all involved, including the many volunteers who provided banksia samples and contributed to the project. The Wettenhall Environment Trust provided an amazing supper! The Kara Kara Conservation Network and North Central Catchment Management Authority also provided support and funding for the project. The presentation was made possible through funding from the National Landcare Program. Many thanks to Adam for his thoughtful presentation, and to Bonnie for organising the event. It was a great evening, leaving us all with positive moves we can each make. When we spend so much money ‘peeing in a wet suit’ (ie. we get a lovely warm feeling but no-one else notices any difference), this was money very well spent. The atmosphere was positive and welcoming to all. The venue excellent. The food even better. I’ve rarely spent a more productive and rewarding evening. Hear! Hear! This is fascinating stuff and can inform future actions to ensure greater effectiveness. Thanks to Harcourt Valley Landcare Group and Bonnie for organising this. Wish I had been able to attend but this summary makes me feel much more knowledgeable about the current state of the Silver Banksia.